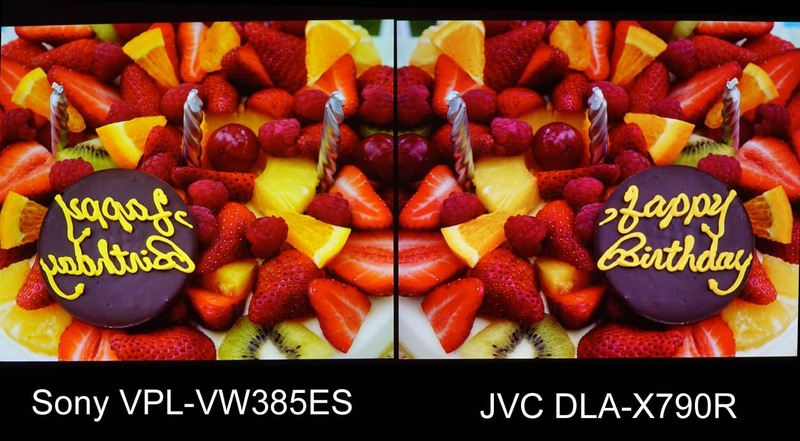 Are JVC Black levels really the best in the industry? How does 4K e-shift5 really compare to native 4K? These and other image quality questions will be addressed in this comparison. Both of these projectors are relatively new – they were introduced at the annual CEDIA convention in September of 2017. Both projectors represent very refined electronics, performance, and feature sets. Both have lens memory for 2.35:1 capability, 3D HD capability, fast motion compensation, and low latency modes for gamers. In this comparison we will focus on the image quality differences. We will also introduce the Quantified Theo Charts, which will allow a relative comparison to all projectors we test and compare in the future. We have established 3 new tests for black level comparisons and 2 for HDR performance and light output comparisons. TVS Pro is neither paid by, nor compensated in any way, by any manufacturer or sponsor to do these tests and comparisons. Unlike some online product reviews, we are not influenced by, nor do we currently accept paid advertisements from, any manufacturer or distributor. Our purpose in doing these comparisons is to provide our customers and own sales team with knowledge and information, along with visual, real world, side-by-side comparisons to make informed decisions. We learned many years ago in the professional simulator and government applications that you cannot, or should not, make product decisions based on manufacturer’s specifications or isolated technical reviews when only a single projector is tested and not compared to the competition. We have also learned that price is a relative guideline to the actual performance and there are many exceptions to, “you get what you pay for,” when it comes to new technology and new innovation products. Both of these projectors represent a sweet spot in the price vs. performance range of each manufacturer’s projector line up. By that, we are referring to the fact that if you go below this price range you will give up a significant level of performance, and if you go to the next higher level, the price curve gets extremely steep. You will get a slightly higher level of performance, but the cost for that higher performance is significant. Either of these projectors, when properly set up and optimized for a given screen and room environment, can give a very satisfying level of image quality and entertainment enjoyment. Price-wise, this is not quite a fair comparison as the Sony is about a $2,000 more expensive projector, but we were interested mainly in two things: could the JVC really deliver better blacks than the more expensive Sony, and what visual differences would there be in the native 4K and the new 4K e-shift5 technology. For example, could the difference be detected at a typical 4K viewing distance of 1.5 times the screen height, and what are the real differences even close up at the screen? Weight: 31 lbs. 34.49 lbs. Both projectors were set up at equal distances from our Stewart StudioTek 130 Reference 2.35:1 screen with a screen gain of 1.3 with each image approximately 70″ diagonal side by side. Since both of these projectors have very complete calibration capability, and come out of the box with several picture mode settings that are really adequate for most HD sources, we only did a minor calibration with respect to white point, CMS, black levels, and contrast. With more time, both projectors can achieve 100% of the HD color standard of REC709. Any color differences shown in these photos of HD images are the result of slight variations in final calibration, or camera capture, and should not be considered for any key differences between these projectors. Both projectors are capable of 100% of REC709 color standard for HD and non HDR 4K sources. 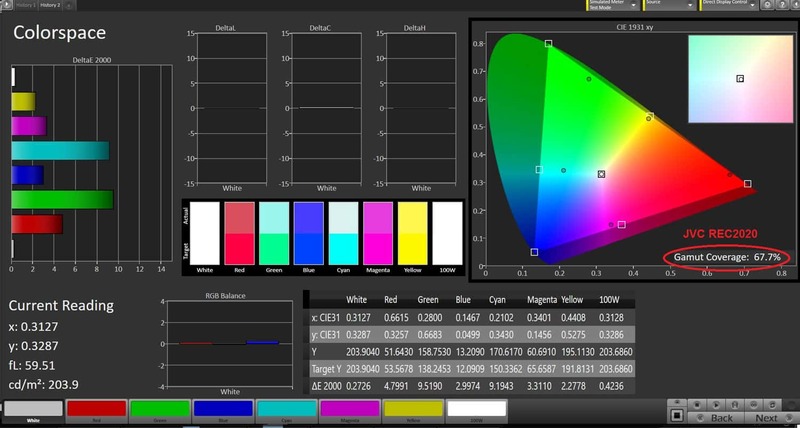 The Sony, with just a few tweaks came in at 99.9% of REC709 Color gamut. Likewise, the JVC came in at 99.6% of REC709 color as well. The slight difference of .3% can be seen on a few scenes particularly in the yellow and greens which is where they were the most different. For the VPL-VW385ES, notice the much larger bright color triangle in the REC2020 color gamut. This is the goal of all 4K HDR displays. 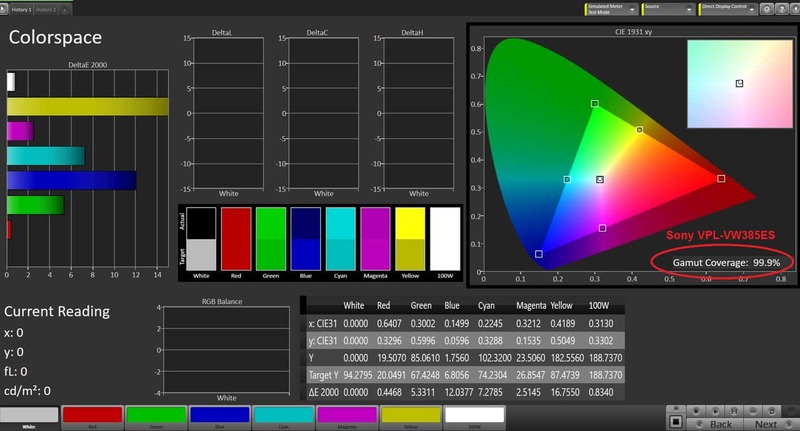 Currently no projector under $100K can achieve 100% of this wide color gamut. In this example you can see the slight differences as recorded in the charts above and display themselves in the actual image. This image is from the Extron Shootout test discs. 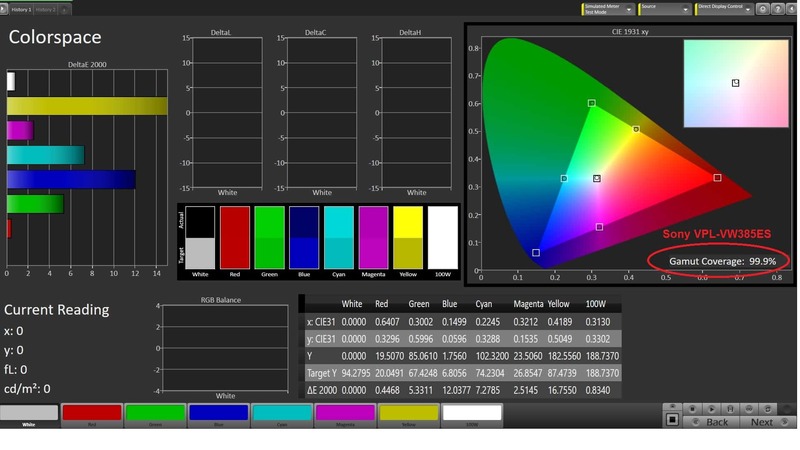 Although there are some minor differences in their maximum color gamut capability, I would not choose one over the other when it comes down to color reproduction, calibration capability, or percentage of REC2020 color. Read the 2nd part of this review that covers contrast, black levels, 4K detail, and HDR Performance! 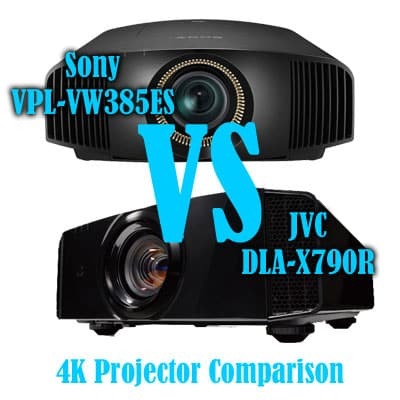 This entry was posted in AV Solutions, Home Theater and tagged 4k, dla-x790r, jvc dla-x790r, projector comparison, REC2020, REC709, Sony VPL-VW385ES, sony vs jvc, vpl-vw385es, vpl-vw385es vs dla-x790r. Hey Ted, just thought I’d comment on the recent comparison you did with the Sony VPL385ES and the JVC DLA-X790R: First, in your website comments, you sometimes say to ‘click on the image’ – I presume that is to view it at a larger size; enlarging the image does not work. I tried it with two browsers, Chrome and Firefox, both with the latest updates and the image does not enlarge – so it’s not a browser issue. Also, while I’m logged in using Chrome and writing this, your CAPTCHA code keeps popping up saying the verification has expired and present some new images for me to verify – you can imagine how annoying that might be as I am trying to write this as it has happened three times since I started writing this and I”m not a slow writer. So looks like your site has two issues with coding. As for the two projectors: The SONY has a MSP that is $2000 more than the JVC. For that 2K more on price of the SONY I would expect better black levels. And since the slightly better detail of the SONY true 4K is not all that apparent unless you’re really close-up, its advantage is nullified IMO unless you plan to sit a couple of feet from the screen and watch movies. So, I would have to say that the black level is more important and comes through regardless of where you might sit and in the case of the JVC the black level is clearly better. So considering the price differential and the better black level of the JVC – and everything else looks better to me with the JVC – it’s a clear winner in my book. Now if only the extortion price of their lamps could come down I’d purchase one. Thanks for the very interesting and revealing review. Last comment: CAPTCHA verification popped up a total of 8 times while writing this… Egads ! Hi Peter. Thanks for the comment. I’ve passed the comments regarding the projector review, itself, to Ted. The images should all now be clickable. I’m not entirely sure why, but that ability to open up the zoomed version was disabled. You can also right click and open them in a new tab. In regards to Capcha, we’re also looking into this. We’ve had issues with the Capcha coding itself, that is provided by Google, and we apologize for the nuisance. We are also seeing this now and it is, indeed, very annoying! Peter, we are thinking very much alike. Since the Sony VPL-VW385ES has both a manual iris as well as a dynamic iris we anticipated the Sony would equal the JVC. It does not, even in its lowest and very dim iris position the JVC still has better blacks. You are correct, because the Sony high frequency details are so low in amplitued the JVC eShift5 does a great job in visually matching the Sony. Yes, the lamps on the JVC are expensive, and the laser version is very high priced at $35K We’ll next be looking at the new DLP 4K JVC and probably one of the Optoma UHD projectors. Thanks for your comments and help with the site issues.